Explore projections of future climate. That the planet has warmed is “unequivocal,”1 and is corroborated though multiple lines of evidence, as is the conclusion that the causes are very likely human in origin (see also Appendices 3 and 4). The evidence for future warming is based on fundamental understanding of the behavior of heat-trapping gases in the atmosphere. Model simulations provide bounds on the estimates of this warming. The trends described in the 2009 report4 have continued, and our understanding of the data and ability to model the many facets of the climate system have increased substantially. There are several major sources of uncertainty in making projections of climate change. The relative importance of these changes over time. In the next few decades, the effects of natural variability will be an important source of uncertainty for climate change projections. Uncertainty in future human emissions becomes the largest source of uncertainty by the end of this century. Uncertainty in how sensitive the climate is to increased concentrations of heat-trapping gases is especially important beyond the next few decades. Recent evidence lends further confidence about climate sensitivity (see Appendix 3: Climate Science Supplement). Uncertainty in natural climate drivers, for example how much solar output will change over this century, also affects the accuracy of projections. Given the evidence base and remaining uncertainties, confidence is very high that the global climate is projected to continue to change over this century and beyond. The statement on the magnitude of the effect also has very high confidence. A certain amount of continued warming of the planet is projected to occur as a result of human-induced emissions to date; another 0.5°F increase would be expected over the next few decades even if all emissions from human activities suddenly stopped,11 although natural variability could still play an important role over this time period.12 However, choices made now and in the next few decades will determine the amount of additional future warming. Beyond mid-century, lower levels of heat-trapping gases in scenarios with reduced emissions will lead to noticeably less future warming. Higher emissions levels will result in more warming, and thus more severe impacts on human society and the natural world. Confidence in projections of future climate change has increased. The wider range of potential changes in global average temperature in the latest generation of climate model simulations2 used in the Intergovernmental Panel on Climate Change’s (IPCC) current assessment – versus those in the previous assessment1 – is simply a result of considering more options for future human behavior. For example, one of the scenarios included in the IPCC’s latest assessment assumes aggressive emissions reductions designed to limit the global temperature increase to 3.6°F (2°C) above pre-industrial levels.3 This path would require rapid emissions reductions (more than 70% reduction in human-related emissions by 2050, and net negative emissions by 2100 – see the Appendix 3: Climate Science, Supplemental Message 5) sufficient to achieve heat-trapping gas concentrations well below those of any of the scenarios considered by the IPCC in its 2007 assessment. Such scenarios enable the investigation of climate impacts that would be avoided by deliberate, substantial reductions in heat-trapping gas emissions. Figure 2.4: Different amounts of heat-trapping gases released into the atmosphere by human activities produce different projected increases in Earth’s temperature. In the figure, each line represents a central estimate of global average temperature rise (relative to the 1901-1960 average) for a specific emissions pathway. Shading indicates the range (5th to 95th percentile) of results from a suite of climate models. Projections in 2099 for additional emissions pathways are indicated by the bars to the right of each panel. In all cases, temperatures are expected to rise, although the difference between lower and higher emissions pathways is substantial. 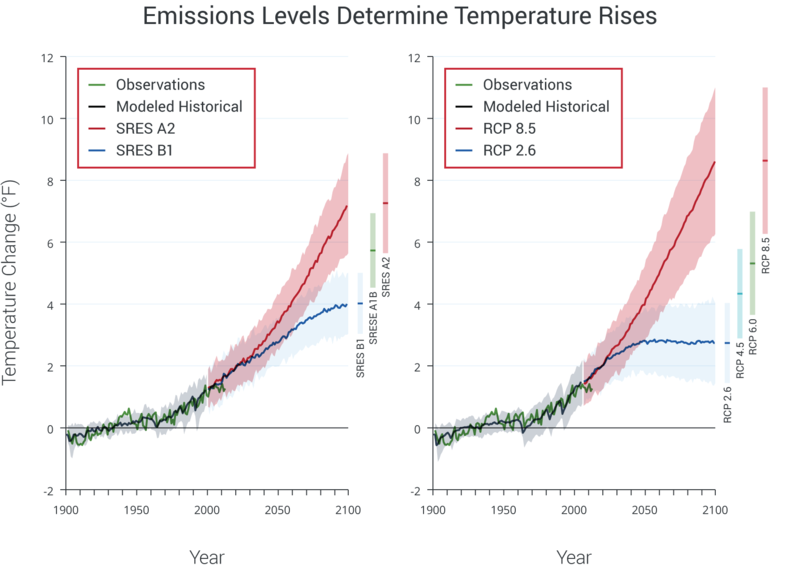 (Left) The panel shows the two main scenarios (SRES – Special Report on Emissions Scenarios) used in this report: A2 assumes continued increases in emissions throughout this century, and B1 assumes much slower increases in emissions beginning now and significant emissions reductions beginning around 2050, though not due explicitly to climate change policies. (Right) The panel shows newer analyses, which are results from the most recent generation of climate models (CMIP5) using the most recent emissions pathways (RCPs – Representative Concentration Pathways). Some of these new projections explicitly consider climate policies that would result in emissions reductions, which the SRES set did not.9,10 The newest set includes both lower and higher pathways than did the previous set. The lowest emissions pathway shown here, RCP 2.6, assumes immediate and rapid reductions in emissions and would result in about 2.5°F of warming in this century. The highest pathway, RCP 8.5, roughly similar to a continuation of the current path of global emissions increases, is projected to lead to more than 8°F warming by 2100, with a high-end possibility of more than 11°F. (Data from CMIP3, CMIP5, and NOAA NCDC). Figure 2.5: Projected change in average annual temperature over the period 2071-2099 (compared to the period 1970-1999) under a low scenario that assumes rapid reductions in emissions and concentrations of heat-trapping gases (RCP 2.6), and a higher scenario that assumes continued increases in emissions (RCP 8.5). (Figure source: NOAA NCDC / CICS-NC). Projections of future changes in precipitation show small increases in the global average but substantial shifts in where and how precipitation falls. Generally, areas closest to the poles are projected to receive more precipitation, while the dry subtropics (the region just outside the tropics, between 23° and 35° on either side of the equator) expand toward the poles and receive less rain. Increases in tropical precipitation are projected during rainy seasons (such as monsoons), especially over the tropical Pacific. Certain regions, including the western U.S. (especially the Southwest4) and the Mediterranean, are presently dry and are expected to become drier. The widespread trend of increasing heavy downpours is expected to continue, with precipitation becoming less frequent but more intense.13,14,15,16 The patterns of the projected changes of precipitation do not contain the spatial details that characterize observed precipitation, especially in mountainous terrain, because the projections are averages from multiple models and because the effective resolution of global climate models is roughly 100-200 miles. One important determinant of how much climate will change is the effect of so-called “feedbacks” in the climate system, which can either dampen or amplify the initial effect of human influences on temperature. One important climate feedback is the loss of summer Arctic sea ice, allowing absorption of substantially more of the sun’s heat in the Arctic, increasing warming, and possibly causing changes in weather patterns over the United States. The observed drastic reduction in sea ice can also lead to a “tipping point” – a point beyond which an abrupt or irreversible transition to a different climatic state occurs. In this case, the dramatic loss of sea ice could tip the Arctic Ocean into a permanent, nearly ice-free state in summer, with repercussions that may extend far beyond the Arctic. Such potential “tipping points” have been identified in various components of the Earth’s climate system and could have important effects on future climate. The extent and magnitude of these potential effects are still unknown. These are discussed further in the Appendix 4: Frequently Asked Questions, under Question T.
Climate sensitivity has long been estimated to be in the range of 2.7°F to 8.1°F. As discussed in the Climate Science Appendix, recent evidence lends further confidence in this range.